When I learned that the OFNC was planning to hold another butterfly outing at Larose Forest this year, I was thrilled. I had enjoyed last year's walk so much - mostly because of the two incredibly knowledgeable leaders, Peter Hall and Christine Hanrahan - that I signed up as soon as I heard they would be leading the outing again this year. The walk was held on a weekday again, as the middle of the week tends to be quieter than the weekends, so I took the day off work to attend. Just like last year, we entered the forest via Russland Road, turning onto Saumure and then heading straight into the forest along Indian Creek Road. 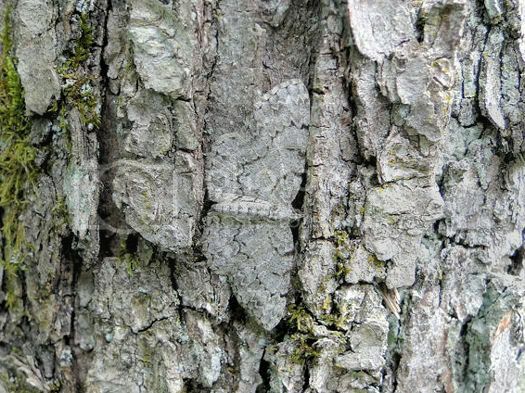 The walk was to take place along Concession 10 again, which is known for its richness in biodiversity and for being one of the few places where the Mulberry Wing can be found. Unlike last year, the weather was almost intolerably hot....temperatures reached 34°C, with the humidity making it feel about 40°C. There wasn't much shade along Concession 10, but I brought a large bottle of ice water to help combat the heat. 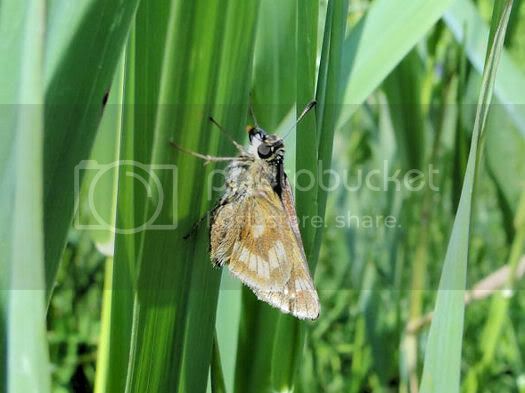 Lots of small orange skippers were fluttering among the roadside weeds as we began our walk along the gravel road. I found one nectaring on some milkweed before we even left the shade of the large evergreens at the entrance to Concession 10, but it was very worn and we were unable to identify it. A little further along Peter caught a Long Dash skipper in his net and placed it in a glass jar to show the group. This was a butterfly I've seen before, but a handsome one. 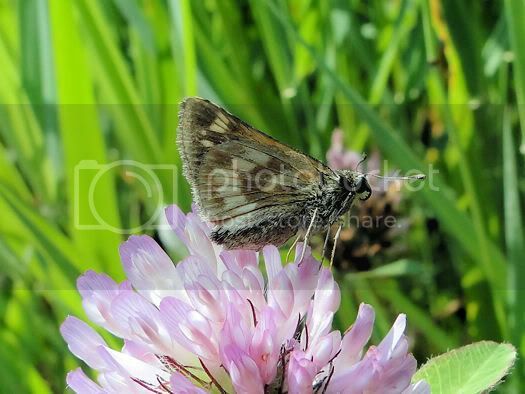 After Peter released it, the butterfly landed on some clover where I was able to photograph it. There were lots of European Skippers flying, making it difficult to spot the native species we were searching for. 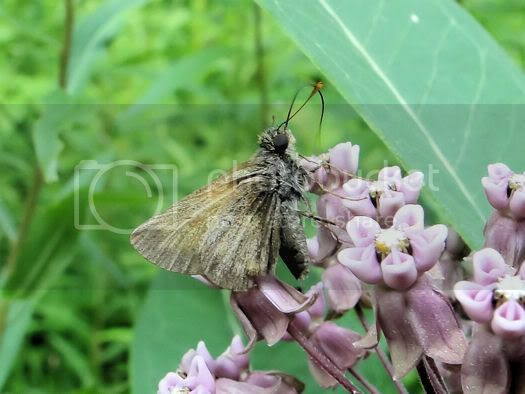 However, the group did manage to find one Least Skipper, one Indian Skipper, four Peck's skippers, one Crossline Skipper, one Northern Broken Dash, one Hobomok Skipper, two Delaware Skippers, and several Dun Skippers. We didn't find a Mulberry Wing. 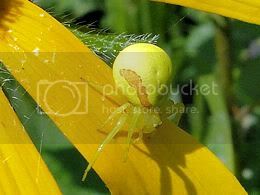 During our search, someone pointed out a Goldenrod Crab Spider on a leaf. These spiders hold their legs out to the side, much like the crabs they are named for. 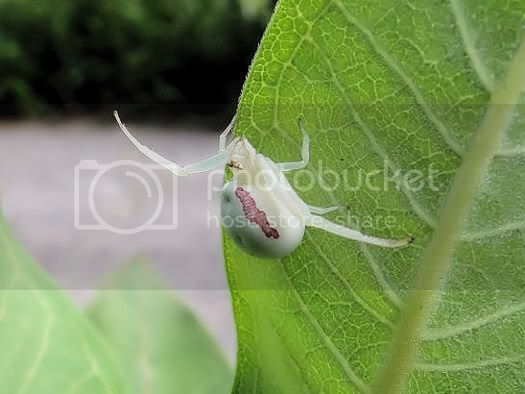 They can change their colour from yellow to white to match the flower it is sitting on, although they are conspicuous on flowers of other colours. The change between white and yellow takes a couple of days to complete. 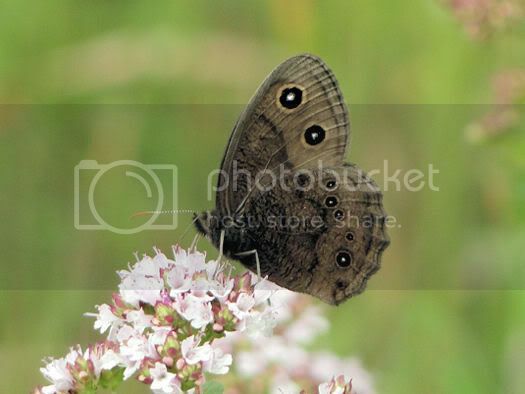 Once camouflaged, they simply sit on the flower and wait for an unsuspecting insect to land. They do not spin webs to capture prey. 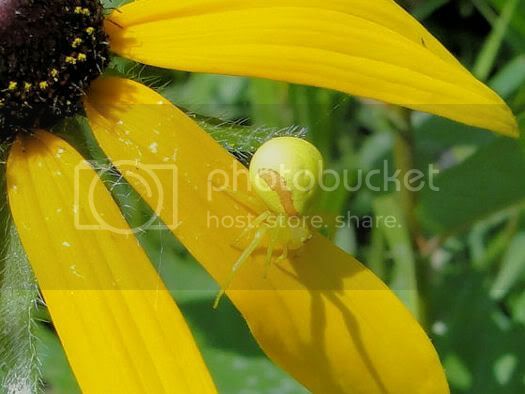 We also found a second spider on some Rudbeckia nearby; this one was yellow, and more successful at blending in with its surroundings. 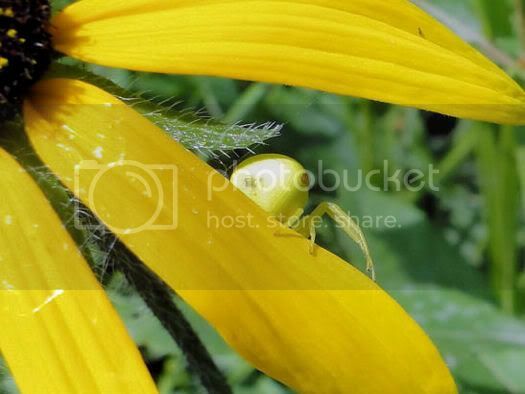 The two spiders were both very shy, darting beneath the flower petal or behind the leaf whenever we tried to photograph them. We found an interesting variety of "true" butterflies. These included one Harvester, three Acadian Hairstreaks, at least 15 Great Spangled Fritillaries, one Atlantis Fritillary, one Silver-bordered Fritillary, one Eastern Comma, two beautifully fresh Red Admirals, a few White Admirals, two Viceroys, and two Monarchs. I wasn't able to get any photos of either of the two hairstreaks that I saw; they were both quick to fly off before I could get my camera ready. 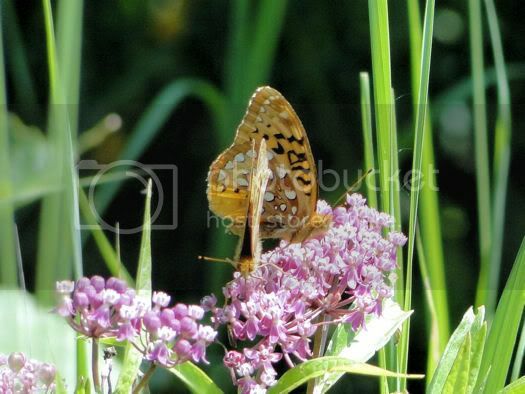 I did get one photo of two Great Spangled Fritillaries on some swamp milkweed. These beautiful butterflies kept sailing by during the walk, and although we netted most of them hoping for one the less common fritillaries, only once did we find an Atlantis Fritillary. My best find of the day was this Northern Broken Dash skipper. He was so busy feeding on the nectar of these flowers that I was able to get some decent macro shots. Because he was so dark, I thought he was a Dun Skipper at first, until I saw the prominent spots on the hindwing. He also had a beautiful purple sheen to his wings which the Dun Skipper does not have. This is the first time I've seen or photographed this species, to the best of my recollection, so it made up for not getting any pictures of the Acadian Hairstreak. Few of the skippers paused long enough to photograph them; while this fellow did, he was so worn that again it was impossible to identify him. In addition to the butterflies, we also saw a couple of Ctenucha moths and several dragonflies, including Twelve-spotted Skimmers, Dot-tailed Whitefaces, Four-spotted Skimmers, Common Whitetails, and a couple of unidentified emeralds flying over the road. 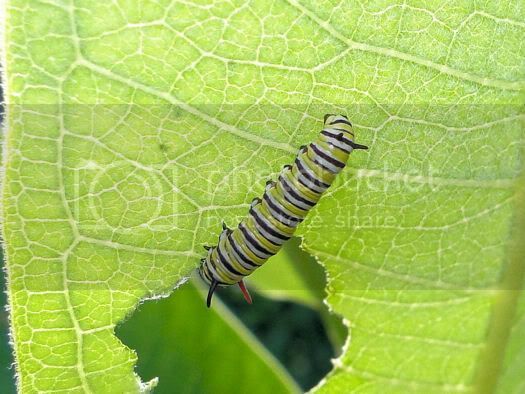 The other interesting insect sighting consisted of three monarch caterpillars feeding on a milkweed plant. Finally, in the bird department, we were serenaded by two singing Hermit Thrushes while we ate lunch in the pine forest, and heard Pine Warblers and Red-eyed Vireos singing as well. Because it was so hot, the birds were much quieter out on the open road. Although I enjoyed the outing immensely, I was happy to return to my car where I turned the air conditioning on full blast as I drove back home to Kanata. I went home for two hours, and after resting and re-hydrating, I decided to go out to the Beaver Trail for an hour. 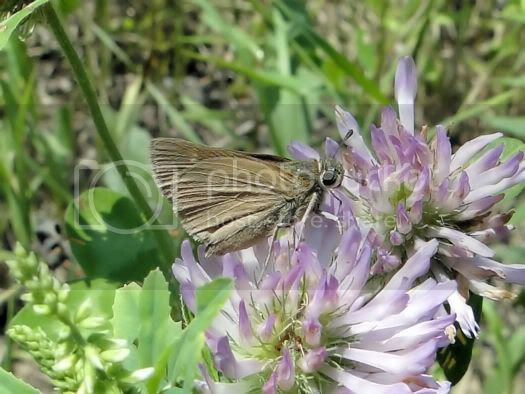 I was in the mood to find some more skippers, and the meadow there is a great spot to find them. Also, the clouds had begun to roll in, bringing some much-needed relief from the blazing hot sun and making the temperature was slightly more bearable. At the Beaver Trail, I found only a few Dun and European Skippers in the meadow. 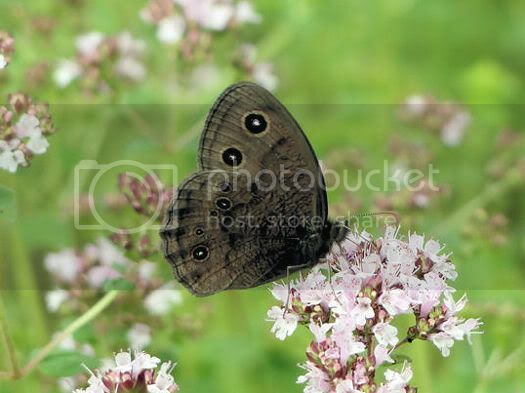 However, several Common Wood Nymphs were flying about, landing on the lovely pink blossoms of the wild oregano that carpets the meadow. 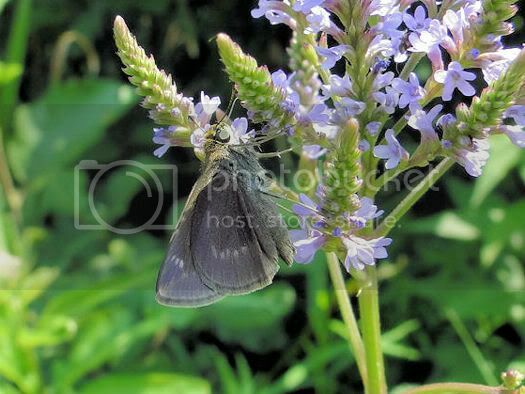 So instead of photographing skippers, I spent most of my time photographing these lovely dark butterflies. There wasn't much activity at either boardwalk, but while walking in the woods I saw this lovely moth fly by and land on a tree. He was so well camouflaged that if I hadn't seen where he landed I wouldn't have known he was there. Despite the heat, it was a great day to be off work. I really enjoyed the walk at Larose Forest, and had fun searching for butterflies. It's always great to see such a wonderful variety, and the beginning of July is the best time to see the greatest number of species!